Hair transplantation is an advanced procedure to treat patient with hair loss. It has been successful from years in providing best results from its processes. Though hair transplantation is advanced and trusted procedure but it requires healing and recovery time to produce relevant results. When hair transplant is done at some advanced clinic like hair clinic in Ahmedabad, Avenues the recovery period is comparatively less. 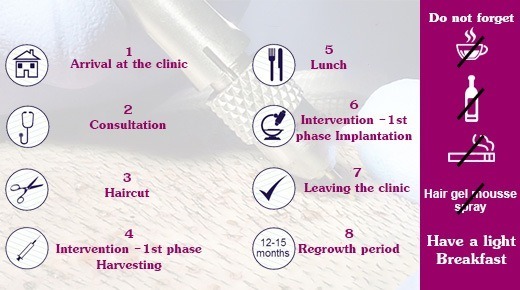 Even though recovery period may vary from doctor to doctor and patient to patient but it do require time for seeing desired results and thus to recover fast with positive outcomes doctor suggests some post operative instruction that must be followed by the patient after the hair transplant surgery. Once you are done with your surgery you must never forget to ask your hair expert about the precautions that you must take after the surgery. When you go for hair transplant by a hair specialist doctor in Ahmedabad he provides best treatment with best after care instructions. It is essential to follow the instruction given by doctor because it can help in easy and instant recovery and if ignored it may lead to negative results of the treatments. Different types of instructions are given by doctor after the surgery. You need to follow a strict routine with compulsory post operative care as suggested by doctors. The care required in initial days after the procedure is comparatively higher than the care required after few months. One can consult a doctor and can stop following this care once the results are noticed. Do visit the clinic immediately after three days after the procedure. It is because head wash is necessary on this day. Do wash your head with a mild shampoo for at least 14 days from day following after the surgery. Do wear head band for at least 7 days after the surgery. Do not do any physical exercises like weight lifting etc for at least 6 weeks post surgery. Remember stitches require healing time and they will take approximately 14 to 21 days for absorbing once they get removed after 2 weeks. Do clean scalp with easy and gentle hands. Remember falling of few transplanted hair is normal. Do not use oil message for at least 1 week. Later you may do scalp message after 10 days of treatment but only 20 min before the bath. The numbness and stitch line decreases at the area of transplantation may take time of about 3 to 6 weeks. Massage at scalp is necessary after the few days as it will increase the recovery process. You may Spray Hair4U, 5% or 1ml twice daily. Only go for such treatments with the prior permission of your respective hair doctor. You may consult a hair expert after the hair transplant in Ahmedabad, Avenues for best post operative instructions and effective results. If done with advance hair clinic in Ahmedabad you will notice results comparatively faster. You may notice hair loss at the donor site for about few weeks but later in 3 to 6 months all this hairs will start a full recovery. In about a month transplanted hair will fall leaving behind the roots of hair in the scalp to grow. With the help of this root hairs will start to grow in 3 months. Full density of hair can be noticed in 10 to 12 months. You can comb your hairs after 3 month in front direction.